When we hear about the flu pandemic of 1918, we can be blown away by the number — as many as 50 million people died, many more than the number who died on the battlefields of World War I. 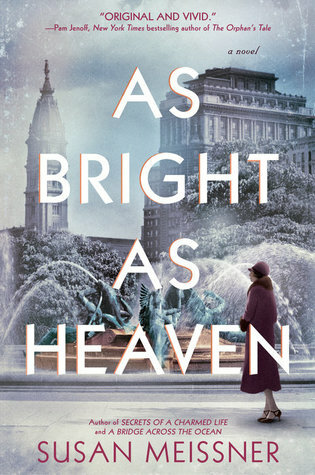 In As Bright As Heaven, this unfathomable global catastrophe is made personal as we see the flu and its devastating impact through the experiences of one family. The Bright family, having already suffered the loss of an infant to a heart condition some months earlier, relocates to Philadelphia from the countryside so that the father can start a new career as partner and heir to his uncle’s funeral home business. For the mother Pauline and her three daughters, it’s a chance at a new life in a new city, moving away from the location of their recent heartbreak and starting over. Between living in the family quarters of the funeral home, the continuing war in Europe, and then the onslaught of the flu, the family can’t escape death. Through the eyes of Pauline and each of the girls, we see the darkness of the time period as loss piles upon loss, with no rhyme or reason for who lives and who dies. The story of the Spanish Flu pandemic is tragic and fascinating, but I found the individual characters and their perspectives less compelling than I would have hoped. Perhaps having so many narrators — not just Pauline, but also the three daughters, one of whom is only nine years old — dilutes the immediacy. 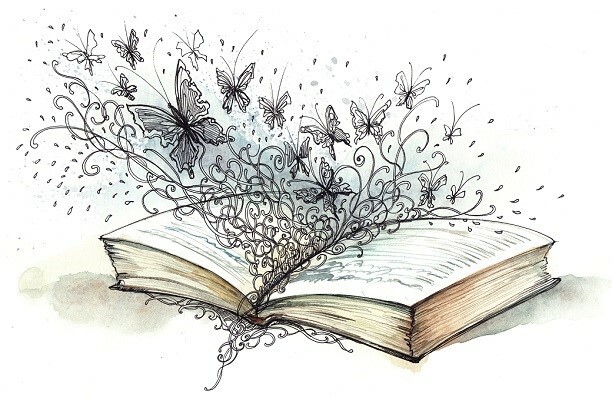 The book gets off to a slow start, although the pace picks up quite a bit from about 40% onward, once the flu begins to spread and the family’s life begins to change. The subplot about the orphaned baby adds some suspense, but it’s fairly simple to see where that storyline is going. 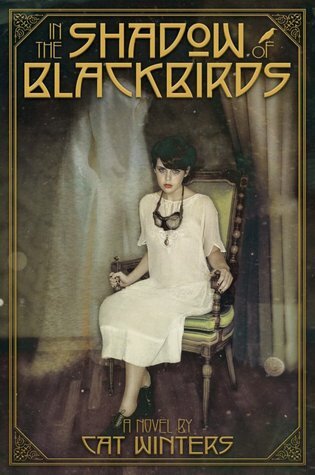 I liked the characters well enough, and overall thought this was a fine read about an interesting time period. I can’t really put my finger on why the book as a whole just didn’t particularly grab me. I was dying to read this book as soon as I heard of it, so I preordered and got it right when it was released in August 2016. I can’t believe this book has been sitting on my nightstand for a year now! I’m ridiculous. I still really want to read it — I love the idea of mediums working in military intelligence! It sounds really awesome, and I’m picking this as my Shelf Control book to try to shame myself. Really, I have to stop buying books and then not reading them, especially when they appeal to me so much! Too many books, too little time… I need to be better at prioritizing my reading in 2018! The synopsis pretty much covers it all. 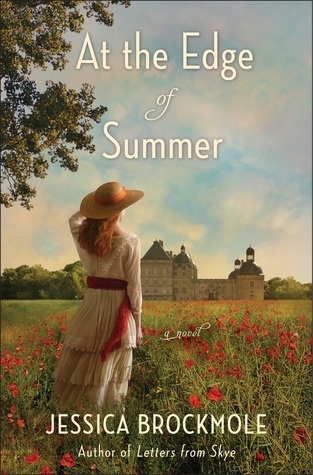 At the Edge of Summer is a book about two people who meet one summer, a 15-year-old orphaned girl and a 19-year-old college student. They form a strong bond and help each other discover crucial aspects of themselves, then spend years apart, separated first by geography and then by war. The story should have been much more moving than I found it. I simply didn’t connect with the characters in the first section of the book, during their early summer together, so I never really invested in their connection or their relationship. Clare’s artistic aspirations didn’t resonate with me, and I couldn’t envision her as a real person. Luc is much more sympathetic, and the portions of the story about his wartime experiences are quite sad to read. Still, something about this book just left me cold. I was interested to see the depiction of the real-life studio in Paris that specialized in masks for men disfigured during the war. I’ve encountered versions of this story before, most recently in a short story in the Fall of Poppies collection (to which Jessica Brockmole contributed a terrific story, by the way). The studio really existed, and its real-life founder, Anna Coleman Ladd, is included in this novel as well. Stories of the First World War and the horrific experiences of the soldiers, on the battlefields, in the trenches, and upon their return to society, are always moving and startling to read about. Somehow, though, At the Edge of Summer failed to fully engage my emotions. I consider it a decent novel, but wouldn’t go farther than saying that it was a fine read and I don’t regret the time spent on it. Bravo to Cat Winters for creating a chilling yet realistic world in her debut novel! In the Shadow of Blackbirds is set in a time of absolute horror in the United States, as the awful combination of a brutal war and a deadly flu pandemic makes death feel like a constant presence. The author does a masterful job of creating the feel of the time period, with paranoia and terror rampant in the cities and streets, and with no safe place to hide. Mary Shelley is a smart, courageous young woman who sees her whole world turned upside down as her father is imprisoned for treason after daring to speak out against war. As she flees Portland to take shelter with her aunt in San Diego, she seeks word of the boy she loves, only to be told that he’s died a hero’s death in the war. But as Stephen visits her in her dreams and then in waking moments, she realizes that her skepticism about spiritualism may be challenged by a voice trying to reach her from the other side. This book conveys so much without ever feeling like a history lesson. Through Mary Shelley’s experiences, we see the impact of the war on the homefront, the sickeningly high death toll of the influenza epidemic and the futility of the home remedies used to ward off disease (garlic-flavored chewing gum, bathing in onion water — ugh), the horrible condition of the injured, maimed soldiers home from the battlefields, and the desperation of the bereaved that makes them easy prey for charlatans claiming to be able to channel their dead loved ones. 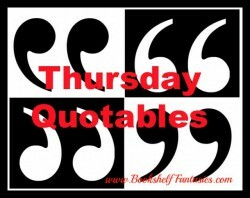 The plot is tautly woven and fast-paced, but never at the expense of character development. We learn so much about Mary Shelley’s character and her relationship with Stephen through their letters sprinkled throughout the book, as well as by seeing Mary Shelley’s determination to figure out the secrets surrounding Stephen’s messages and help him find peace. 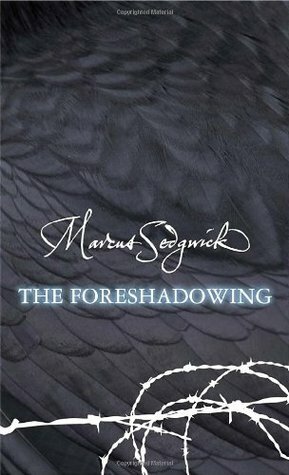 I highly recommend In the Shadow of Blackbirds for anyone who enjoys historical fiction — as well as for anyone who enjoys a good, suspenseful tale, grounded in reality but with a hint of the supernatural. 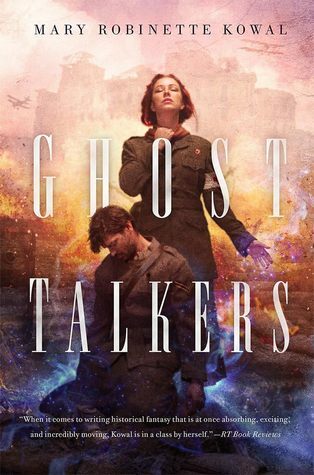 Cat Winters is an extremely talented author, and I can’t wait to read more of her work! 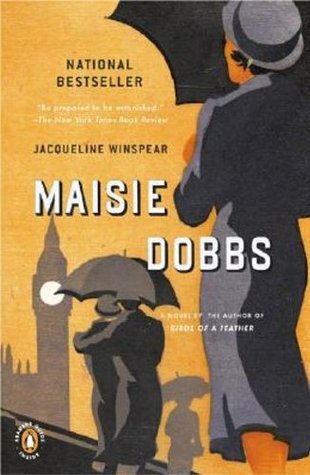 When we first meet Maisie Dobbs, it is 1929, and she is opening up her London office for the very first time. Maisie, a young woman of about 30, is going into business as a private investigator, thanks to the tutelage of her mentor, Maurice Blanche, and the sponsorship of her patroness, Lady Rowan. Maisie is an extremely intelligent woman, reserved by nature, strikingly attractive — and it’s immediately apparent that this is a person who has been hurt deeply in her lifetime. That doesn’t stop Maisie, though. She is more than ready when her first client walks through her door, hiring her to investigate his wife’s long afternoons away from home and to determine if she’s being unfaithful. What Maisie discovers is not infidelity, but yet another lost soul still bearing the wounds of the Great War that ended ten years earlier. As Maisie pursues the trail of clues, her memories of her own wartime experiences come flooding back, demanding to be faced after all this time. Maisie Dobbs is constructed around a mystery — who is the man whose grave the client’s wife cries over, and why does his gravestone list only his first name? The solution to this case leads Maisie back into the world of wounded soldiers and the terrible sacrifices and pain suffered by those who made it back home. 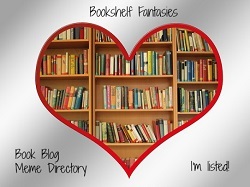 At the heart of the book lies Maisie’s own story. 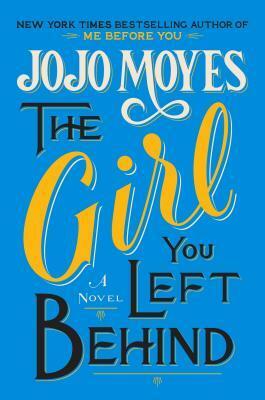 As her investigation begins to relate to the war, the center third of the book shifts scene and time and takes us back to Maisie’s teen years, when she works as a housemaid in Lady Rowan’s home. Maisie’s eagerness to learn leads her to an education sponsored by Lady Rowan, eventually entering college at Cambridge before the harsh reality of war causes her to change path. Maisie abandons her college studies and enrolls in nursing school, ultimately training as a battlefield nurse and getting sent to a field hospital on the frontlines in France. I won’t go into too much detail, other than to say that Maisie’s experiences there lead to a tragic loss that has haunted her ever since. And in investigating the case of the soldier’s grave, Maisie is finally forced into confronting her sad, painful history. I picked up this book not knowing what to expect. I had heard of the Maisie Dobbs series, and thought this first book would be a more or less straightforward detective story. What really impressed me about Maisie Dobbs is how deep and layered the story is. While Maisie is indeed an investigator, the setting and the time period are gateways into an examination of the horrors and tragedies of the terrible losses suffered during World War I — and the ongoing pain and suffering experienced by those who came home to face a lifetime of disfigurement and isolation. Through Maisie’s thoughts, we come to feel the terrible depth of the tragedy as experienced on a very personal level, and yet there’s also hope. While Maisie carries emotional wounds that will always be with her, she’s also creating a new life in a new era, using her brains and her inner strength to face life on her own terms. 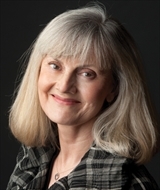 The audiobook narrator, Rita Barrington, does a lovely job of capturing Maisie’s inner dialogue, as well as voicing the people in her life. She does an excellent older, aristocratic voice for Lady Rowan, and a cheeky, working class voice for Maisie’s assistant Billy. Even while narrating conversations between multiple characters, it wasn’t hard to follow or to figure out who was talking at any given time. I liked the clarity and sweetness of Maisie’s voice, and the gentleness with which she speaks to all, especially to wounded soldiers and others in need of her care. 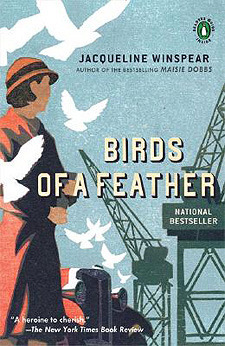 According to Goodreads, there are 11 Maisie Dobbs novels currently in print, with a 12th scheduled for release in 2016. I don’t really know where the series will go from here: Will it be a more traditional mystery series, with a new case forming the focal point of each book? Will Maisie’s connections to the war continue to inform the storylines? I suppose I could read the synopses of the next few books in the series, but really, I’d rather just wait and find out for myself. I’m quite sure that I’ll continue with this series, which has such a well-written start in this first book. The emotional depths of this novel make it an affecting and throught-provoking read. There’s something about WWI fiction that is utterly compelling and tragic, and I found myself very much enthralled by the character of Maisie Dobbs and her fascinating life. Hearing the voices of Maisie and the other characters, as portrayed in the audiobook, made the experience even richer, and I look forward to listening to the 2nd book as soon as possible. Spring 1915. On a sprawling country estate not far from London a young woman mourns her husband, fallen on the battlefields of what has been declared the first World War… But the isolated and eerie stillness in which she grieves is shattered when her home is transformed into a bustling military hospital to serve the war’s most irreparably injured. Disturbed by the intrusion of the suffering men and their caretakers, the young widow finds unexpected solace in the company of a wounded soldier whose face, concealed by bandages, she cannot see. Their affair takes an unexpected turn when fate presents her with an opportunity: to remake her lover with the unwitting help of a visionary surgeon and an American woman artist  in the image of her lost husband. Inspired by the little-known but extraordinary collaboration between artists and surgeons in the treatment of wounded men in the First World War, The Crimson Portrait peels back layers of suspense and intrigue to illuminate the abiding mysteries of identity and desire. 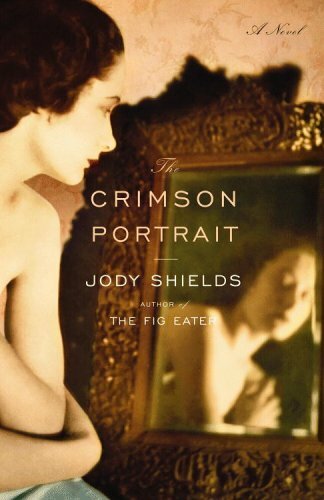 The Crimson Portrait is an atmospheric novel, creating the feeling of life during the Great War. I read this several years ago in the days before Downton Abbey, but now I can’t help but picture this book in a Downton-like setting, with stretchers full of hideously wounded young men filling the elegant rooms of the manor. In The Crimson Portrait, the wounded at this particular estate all suffer from facial injuries, from mild to complete disfigurement. We witness the early stages of facial reconstructive techniques, as doctors and artists work together to alleviate suffering and give these poor young soldiers a chance at something resembling a normal life. Meanwhile, the young widow of the estate sets in motion a plan to alleviate her heartbreak; it’s twisted and unhealthy, sure, but it’s also terribly sad and I couldn’t help but feel compassion for this young woman and her struggle to make sense of her loss. I always find that WWI-era novels like this one, taking place in the most genteel of settings, pack a huge emotional punch, as they convey the utter horror of war and the mindless tragedy of the losses suffered — all in stark contrast to the lovely greenery of the English countryside. In The Crimson Portrait, we see the waste and ruin of a generation of young men, and the terrible, unending ache left to their survivors. It’s a beautifully written story, fascinating and sorrowful, and I recommend it for anyone interested in reading about that particular time in history.